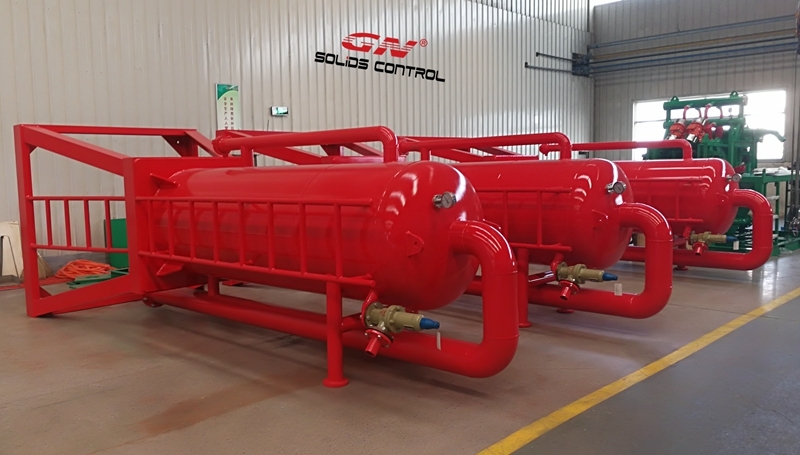 This week GN shipped 3 units of mud gas separator to France, last week we shipped 3 units of same poor boy degasser to CNPC. The mud gas separator is also called poor boy degasser, it is applied to separate the hazardous gas from the gas cut drilling mud before feeding to the shale shaker, the primary equipments of the solids control equipments. The mud gas separator is normally installed beside the solids control system, close the well head, the flare ignitor will be connected with the gas discharge pipe of the poor boy degasser, and fire the separated gas in the remote area. The mud gas separator is skid mounted, installed with chock manifold, it is normally used for deep drilling rig or other drillings, like geothermal drilling, coal bed methane drilling, mining exploration, gas drilling, etc. The fluids discharge line is connected with the mud flow divider or called possem belly inlet, there is bypass valve so the mud can flow to shale shaker directly bypass the mud gas separator. The mud gas separator can separate the hazardous gas like H2S from the gas cut drilling fluids to protect the shale shaker from damaged. The vacuum degasser or centrifugal degasser will be installed on the solids control system mud tank, it also separates the gas from the drilling fluids to keep the drilling mud balance and protect the centrifugal pump. The basic solids control system including shale shaker, desander, desilter, feeding pump, vacuum degasser, decanter centrifuge, mud tank, pill tank, trip tank with trip pump, reserve tank, mud mixing unit, etc. For customized solution of mud pit and solids control equipments, pls contact with GN solids control. We also provide complete solution for drilling waste management system as a zero discharge system, the recycled mud can be reused by the drilling rig, the cuttings can reach the limit of landfill or send them to further process of TDU.